Motorcyclists may soon be required to wear helmets in the state of Arizona. 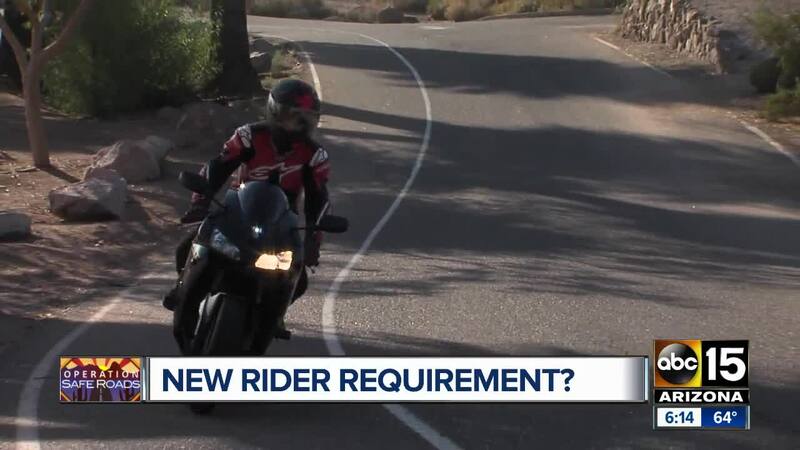 PHOENIX — A new bill proposed to the Arizona House of Representatives could mark a huge change regarding safety standards for motorcyclists in the state. HB 2246, or the working title “motorcycle riders; helmets; fees” bill, proposes all motorcyclists and passengers operating an “all-terrain vehicle or motor driven cycle” must wear a helmet at all times while operating the vehicle. “An operator of a motorcycle, all-terrain vehicle or motor driven cycle shall wear at all times protective glasses, goggles or a transparent face shield of a type approved by the director unless the motorcycle, all-terrain vehicle or motor driven cycle is equipped with a protective windshield,” the proposed bill states. However, those who do not wish to wear a helmet can be exempt from the proposed requirement if they pay a fee when registering their motorcycle, according to verbiage in HB 2246. The fee’s exact amount has yet to be determined; however, payment of the fee allows the driver and passenger of a motorcycle to ride without helmets. According to the proposed bill, law enforcement may not pull a motorcyclist over just because they are not wearing a helmet. If the motorcyclist is in violation of another law and they are not wearing a helmet, the driver can be issued a $500 fine. According to language used in the proposed bill, fees collected from the motorcycle registration fee would be added to the highway user revenue fund. Monies collected from citations would be split between the Arizona Highway User Revenue fund ($200) and the Spinal and Head Injuries Trust Fund ($300). HB2246 was proposed by Arizona democratic representatives Randall Friese, Andres Cano, Rosanna Gabaldon, Alma Hernandez, and Pamela Powers Hannley. It is unclear if and when the bill will pass. Read the full bill HERE .